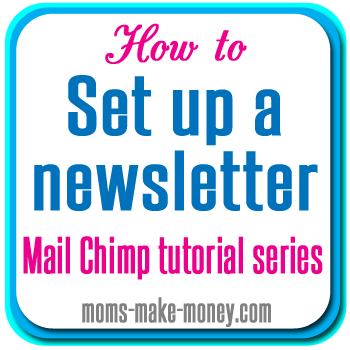 Have you been following the Set up a Newsletter series? We now have our Mail Chimp account set up, our mailing list in place, subscribe boxes on our website, and on our Facebook page. Look back at the earlier posts if you missed these parts of the series. Now that we have the basics, let’s get a little more sophisticated. Mail Chimp (and all good mailing list providers) require a double opt- in. This means when a person adds their name into your subscribe box, they get an email in their inbox asking them to confirm. And it is only if they go on to confirm that they are added to your list. We don’t want to miss a single subscriber, so let’s add our own wording and customise the sign up process. We will even add in a free download to all new subscribers and a coupon code they can use for free shipping off their next order – for example. And all of this is easy – if you have already set up your standard sign up form – you are already mostly done. Watch this next video to perfect your process and get lots of sign ups to your list. Note – you can make this video larger using the full screen option bottom right, so you can follow through the on screen instructions more clearly. You can also increase the video resolution to give greater clarity and definition using the little gear icon that appears on the bottom menu once it starts playing. If you haven’t already done so, you can sign up for Mail Chimp, and for your own Drop Box account so that it is easy to share content and downloads. The last step in the Mail Chimp process is optional. You can use the RSS feature to send an email to all of your subscribers when you post new content. This can either send every time, or on set days each week, or once a week/month etc. This is a great way to remind your subscribers how awesome you are and get them over to visit your site or click on your adverts and earn you some cash. Mail Chimp has a tutorial page and video showing you exactly how to schedule your RSS emails if this is something you might want to do. You can find out more here – RSS Email Campaigns. And that’s it for Mail Chimp. I hope you found it all useful and now have a mailing list set up ready to accept your new subscribers. Offering an incentive is always a good way to entice subscribers – an e-book, free printable or exclusive discount code.